I was feeling in a bit of a creative rut today and after looking through a plethora of images online and still feeling uninspired I – of course – wound up with plants. I stumbled across an image of a kokedama made by one of my students in one of my first ever kokedama classes back at my old shop, Mr Sparrow, in Perth, and recognised it instantly (she had sent me the photo to use in promotional material so I knew it well). From there I somehow ended up seeking out the Japanese for kokedama – as in, the Japanese characters, since “kokedama” is itself a Japanese word meaning literally moss ball. I wanted to see images of authentic kokedama and see how they compared to the types of things people elsewhere in the world (including myself) are making these days. As I was looking at these I realised that everything I am doing these days really comes back to kokedama. Most people probably discover kokedama through their love of plants, but I discovered my love of plants through kokedama. As I was looking at these images of traditional Japanese kokedama I remembered the very first ones I ever saw in Japan in 2006. They were in high end gift and home stores there and I had never seen anything like them. Needless to say, I fell in love and James and I bought one for our friends who were living there at the time. At the time I knew nothing about plants and although I had an interest in them it was only a small part of my life and certainly no part of my working life at that stage. Now I feel as if I live and breathe them and – as evidenced today – they are constantly my greatest source of inspiration and joy. So I have a lot to thank the humble kokedama for. 30 Oct	This entry was published on October 30, 2014 at 1:20 am. 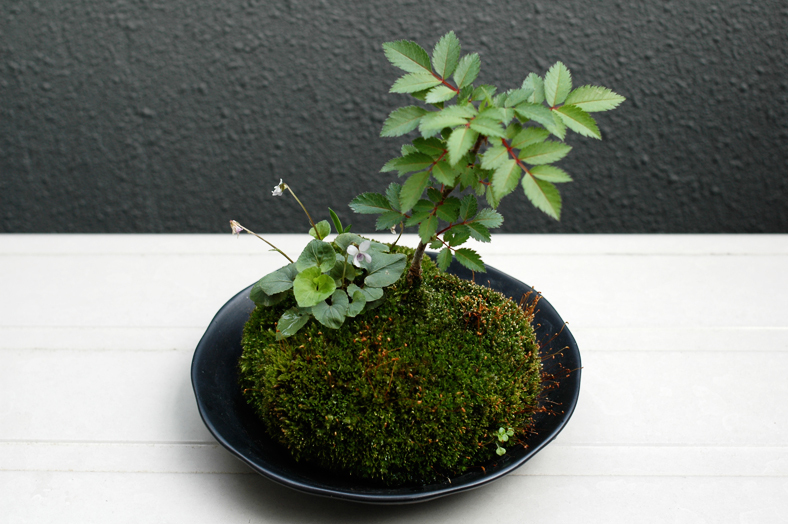 It’s filed under grow, inspire and tagged Japan, kokedama, moss ball, plants. Bookmark the permalink. Follow any comments here with the RSS feed for this post. can you tell me what the plant is with the violets? Thank you …. I will try one this ball is beautiful.